Now, if I can just keep my streusel from melting all over the place! I haven't had good luck with it in my last 2 recipes! The trick is not to melt the butter when you do it. You want to cut in cold-ish or softened butter, like a pastry, so that it's crumbly. Some recipes actually call for melted butter but I HATE that - the streusel on top ends up being rock-hard after you bake it! So I always do it the crumb way, and love it. You obviously didn't read the recipe well enough! You stir it in with flour and sugar. 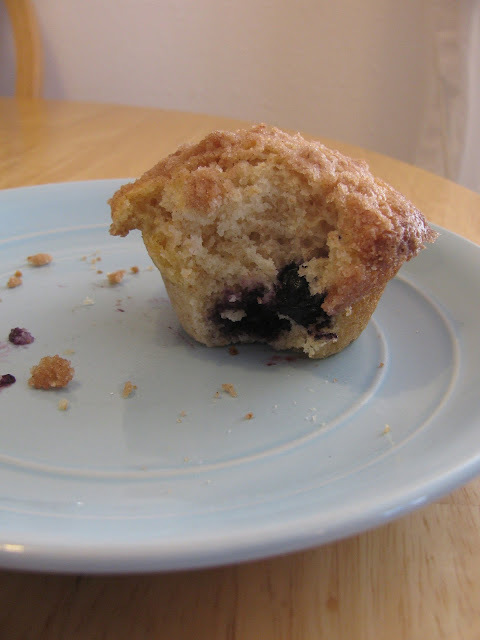 Not only do they not sink (though the muffin in the pic is not a good example of that, lol) but it keeps the mix from turning purple from the juice.